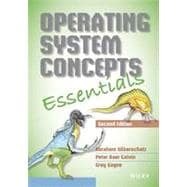 Operating System Concepts Essentials comprises a subset of chapters of the ninth edition for professors who want a shorter text and do not cover all the topics in the ninth edition. The new second edition of Essentials will be available as an ebook at a very attractive price for students. The ebook will have live links for the bibliography, cross-references between sections and chapters where appropriate, and new chapter review questions. A two-color printed version is also available. Chapter 9. . Mass-Storage Structure. PART FIVE. PROTECTION AND SECURITY.